It is with great sadness that we had to announce the sudden and unexpected death on Saturday 10th February 2018 of our baritone Terry Jones. 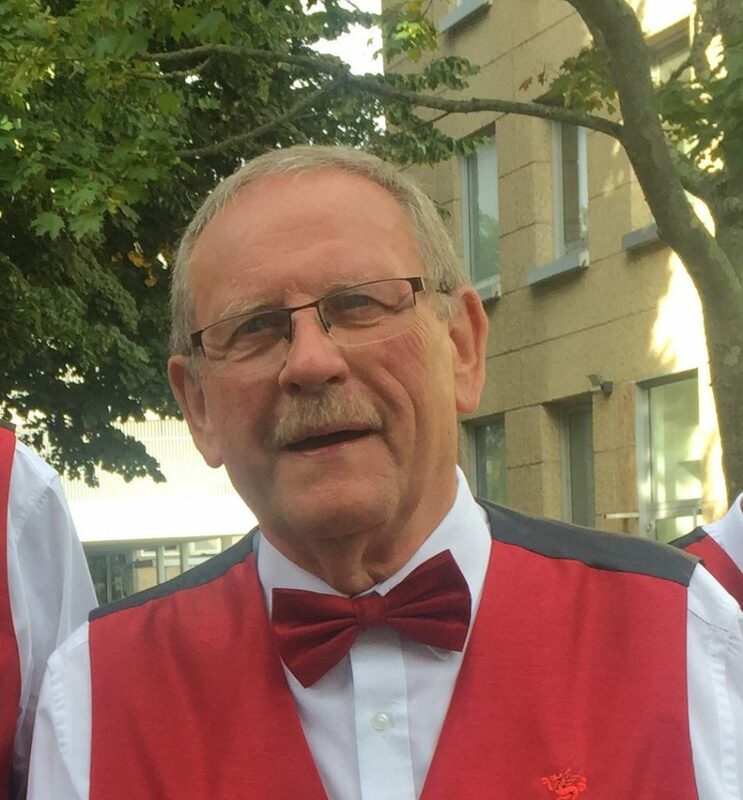 Terry was a current member of our Committee and was a former member, Trustee and Tour Manager of Morriston Orpheus Male Choir, former member of Phoenix Male Voice Choir, and a current member of Côr Dathlu Cwmtawe. He also joined Abertillery Orpheus on their trip to the Lorient InterCeltique Festival last August (where the photo was taken). Terry was Chairman of Penllergare Valley Woods, a governor of Bishop Vaughan School, and held several community responsibilities. His organisational skills, dry wit and endearing personality will be sorely missed by us all. We send our heartfelt condolences to Lynwen, Victoria and Richard. Terry’s funeral was held at 12.00 midday on Friday 23rd March at an overflowing Morriston crematorium. Again this year we were invited by The Friends Of Penllergare to help raise funds for the restoration and upkeep of Valley Woods (and yes, that is the correct spelling! ), and to get the Christmas season really under way. St. David’s church in Penllergaer was bursting at the seams, with all tickets sold in advance for what is becoming an annual event in the village. We were conducted by Glyn Williams (and an enthusiastic 5-year-old girl in the audience) and accompanied by Jonathan Meads as we sang mostly seasonal songs, with Huw Roberts the soloist in O Gymru and Brenin y Sêr. Mrs Joan Lewis MBE is well-known to the Choir, and appropriately for the Christmas season she had brought two of her young protogées to sing. Millie Colebrook sang The Bare Necessities and Mary’s Boy Child, and Maddie Denny sang Reflection and When A Child Is Born. The girls were accompanied by Joan. Our Secretary Robert Harwood compèred the evening and encouraged the audience to join in all the carols. It was a wonderful lead-in to Christmas week, and we thank Jennie Eyers and her many helpers for the refreshments after the concert. Why not take a stroll through the woods to blow away cobwebs during the holiday period? Their coffee shop will sustain you! 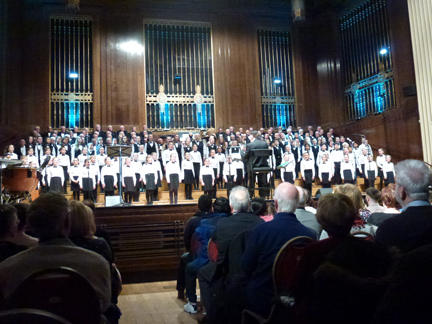 An invitation to join the John Hywel Williams choirs always ensures an excellent occasion, and this Christmas Festival filled the Brangwyn’s stage seating to capacity with performers. In addition to his Hywel Girls’ Choir, Hywel Boy Singers, Angelicus Celtis and Llanelli Choral Society, he had amassed a large primary school choir from the Llanelli/Kidwelly/Burry Port/Ammanford areas, calling it ‘Singcredible’. With accompanist Jane Jewel, guest organist Huw Tregelles Williams, percussionists Gareth Hamlin and Graham Bradley, trumpeter Jac Thomas, all their performances were extremely highly polished, with even the youngest 7-year-old singers giving their all and making a beautiful cohesive sound. It is to John Hywel Williams’ credit that he is able to coach and control so many young people to produce such excellence. It is no wonder that they are so keenly sought-after for stage and television events. Their programme for 2018 already includes many prestigious events. Our own contributions were very well received by the near-capacity audience. We were conducted by D. Huw Rees with Huw Tregelles Williams at the organ, and our Deputy Accompanist Rhiannon Pritchard stepping in at short notice, even after playing at an earlier concert in Cardiff. Baritone Gary Griffiths has been guest artist at one of our annual concerts, so it was good to hear his rich voice again as he sang a varied programme which included the Austrian carol Still, Still, Still, and a couple of Handel arias. He was accompanied on piano AND organ (but not simultaneously!) by the ubiquitous Huw Tregelles Williams. We come away from many concerts saying “this was a night to remember”, and this Festival certainly fell into that category. There are more photos on our Photo Gallery page. Our first concert in Neath for a very long time was to help raise funds for Melin Infants School, and supporting local children. Compered admirably (and emotionally) by Rev. Lynn Maddocks, and coincidentally taking place on Children In Need Day, we were joined by Parti Llwchwr ladies choir and the children of Melin Infants School. The children opened the concert and were a great success, drawing appreciative applause from the capacity audience. They were so well rehearsed that they didn’t even need a conductor! They ended their sequence of songs with an animated encore, which Lynn Maddocks joined in from the pulpit. Parti Llwchwr have an enviable and well-deserved reputation for excellence, and led by Janet Jones, accompanied by D. Huw Rees, they sang six beautiful songs from their repertoire, including Calon Lân to the tune of The Rose, and Lausanne, during which several people were visibly moved. Our own performance was conducted by D. Huw Rees and accompanied by Hywel Evans. We were joined by Parti Llwchwr in Anfonaf Angel and O Gymru, which brought a standing ovation from the wonderful audience. It was good to see that many of the young children and their families had stayed to listen to the performances of the two senior choirs, and we hope that nights like this will inspire them to keep singing as they progress through the education system and beyond. The Choir would like to thank the ladies of the chapel for the fantastic buffet that we enjoyed after the concert, and we look forward to another invitation to sing for our supper! Photos on our Photo Gallery page. 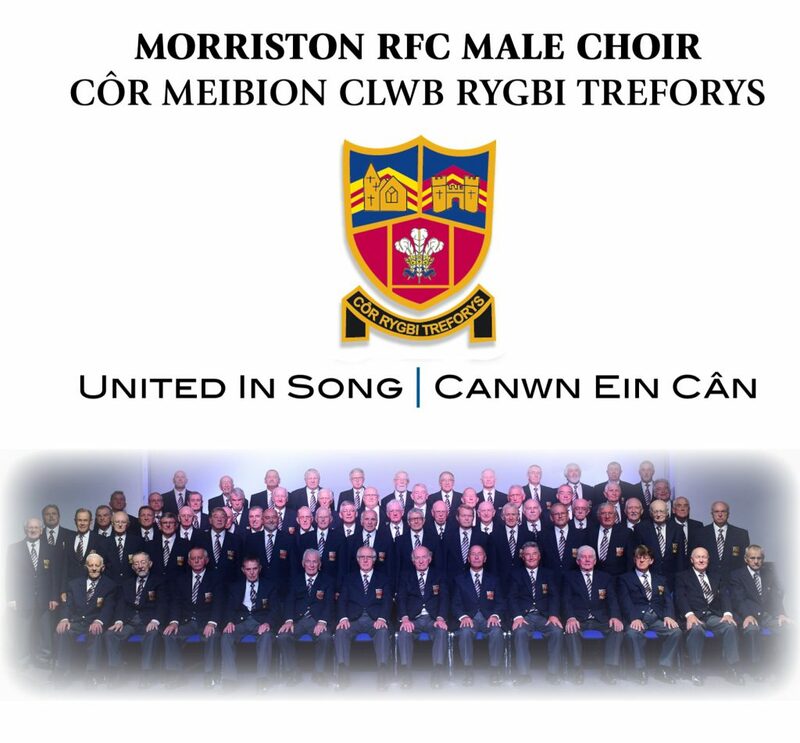 Our new CD UNITED IN SONG/CANWN EIN CÂN is now on sale. It also has a track with soprano Ros Evans! It was fitting that this Festival fell on the exact date of Armistice Day, the 11th day of the 11th month. Less than two weeks since we sang it at the Menin Gate in Ypres, Belgium, we reprised “Mansions Of The Lord”, but this time with accompaniment from Hywel Evans at the piano. The Brangwyn Hall was packed for this Remembrance Day concert and service, with contributions from the City of Swansea Concert Band, City of Swansea Pipe Band, 215 Squadron RAFAC Corps of Drums, Cadet Warrant Officer Josh Carter (who read the poem “In Flanders Fields”), Dancerama, and soloist Keely Morgan, who will also be singing with us in the Welsh Association of Male Choirs’ massed choirs concert in the Albert Hall in May 2018. The Corps of Drums should have had a health and safety warning as they enthralled us with their rythmical offerings, and the young people of Dancerama sang beautifully, with outstanding soloists among their number. Our other contributions were “World In Union”, and “The Holy City”, in which we were joined by Keely Morgan, whose own rendition of “Finlandia” was well received. The traditional service of remembrance was conducted by Rev. Lionel Hopkins MBE, and presentations were made by Her Majesty’s Lord Lieutenant of West Glamorgan Byron Lewis KSTJ. The evening was again compered seamlessly by Brian Sullivan. We thank organiser Phil Flower MBE, British Legion Community Fund Raiser for South Wales, for the opportunity to take part in the city’s tribute to the fallen, which was particularly relevant to the choir, as it followed on so soon after our own emotional visit to Flanders. The timing of this 5-day tour coincided with the 3rd Battle of Passchendaele centenary commemorations, and we were fortunate to be able to book an appearance at one of the nightly Menin Gate services in Ypres. These have been performed at 8.00pm every night of the year since 1927 (apart from a short break during WWII), when the town’s volunteer fire brigade decided to honour more than 54,000 missing British and Commonwealth soldiers whose names are engraved on the monument. It was a very moving ceremony as we sang Mansions Of The Lord and laid a wreath on behalf of the City and County of Swansea. Our other formal engagement was an afternoon concert in Lille Cathedral (Cathédrale Notre Dame de la Treille) after some time for sight-seeing and chocolate shopping. The soaring interior of the cathedral has wonderful accoustics, which not only enhanced the choir’s performance, but also those of soloist Huw Roberts and accompanist Hywel Evans, who played Vidor’s Toccatta on the organ. The large audience showed their appreciation and demanded an encore. The social side of the tour was not overlooked, and after a day in Bruges we spent another touring some of the main WWI sites around the Ypres Salient. Tyne Cot is the largest Commonwealth War Graves cemetery in the world, and apart from almost 12,000 graves the rear walls contain the names of over 34,000 soldiers whose remains are still missing in the Ypres Salient. Most of our party had never visited before, and seeing all those names on this and the Menin Gate panels brought home the terrible loss of life. As a contrast to the open, almost garden-like British cemeteries, we visited the gloomy German cemetery in Langemark, where the remains of more than 19,000 identified and 24,000 unidentified soldiers are buried. Seeing the thousands of names on bronze tablets around the mass grave for the unidentified and the flat black “headstones” for the others made us realise that it was not only British young men were sent to their deaths, but also innocent young Germans too. We visited the new Welsh Memorial in Flanders, singing Sunset Poem, and laying another wreath. Later in the evening we had dinner opposite the memorial at Marc Decaestecker’s deSportman Café, presenting him with a commemorative plate and thanking him and his committee for being instrumental in suggesting and raising funds for the Memorial. It had been a very successful tour for our party of 84 choristers and supporters, and it reminded us of the futility of “the war to end all wars”. There are photos on our Photo Gallery page. Cerith Owens of Loud Applause Productions can be guaranteed to put on spectacular concerts, so we were delighted to be invited to take part in this year’s Annual Royal British Legion Charity Gala Concert in Carmarthen. The list of performers included soprano Gwawr Edwards, The Three Welsh Tenors (Aled Hall, Rhys Meirion & Aled Wyn Davies), City of Swansea Pipe Band, 215 (City of Swansea) Squadron Corps of Drums, compere Brian Sullivan, and guest accompanist Caradog Williams. Tickets had been sold out long before the date, so it was rewarding to sing to a capacity audience on such a stormy night, with our MD D. Huw Rees and Accompanist Hywel Evans in charge of our performance. In order to fit in the other performers and the traditional Tribute to the Fallen, we sang just eight songs, including Mansions of The Lord, which we were due to sing at the Menin Gate in Ypres just over a week later. We were joined by Gwawr Edwards in The Holy City, and Gwawr and The Three Welsh Tenors in O Gymru. Apart from their individual performances, Gwawr and the Tenors combined in Verdi’s Brindisi. It was a wonderful and moving occasion, unaffected by the weather outside, and the compliments from audience members at the end made it even more enjoyable – and we sold out of CDs! Our new one is due out before Christmas, so keep an eye on our website. Some photos by Innovation Photography, Cerith Owens and others on our Galleries page. We had been invited to take part in the prestigious fortnight-long Swansea International Festival, joining forces with our friends at Dunvant Male Choir. This concert demonstrated the powerful sound that 140 male voices can produce, and audience members were well prepared as they left the first few front rows empty! The Musical Directors of each choir (D. Huw Rees for Morriston, and Jonathan Rogers for Dunvant) took turns to conduct our programme of 15 songs. The two accompanists, Hywel Evans and Tony Phipps, did likewise at the piano, with Hywel playing the Hall’s wonderful organ in some of the pieces. Our Bass soloist Huw Roberts sang the beginning of Make Them Hear You, with the choirs joining in the later verses. Soprano soloist Gwawr Edwards always wows her audiences, and we were thrilled by her clear tones and choice of music, which included musical show songs, Lehar, Puccini, and a couple of Welsh songs too. Gwawr was accompanied by Hywel Evans, who was celebrating his birthday with his usual musical flair. In thanking him, Gwawr called referred to him as “my orchestra”. She joined with us in singing Morte Christe. We thank the Festival’s Artistic Director Lyndon Jones for his invitation, and look forward to another appearance at the Brangwyn on Remembrance Day, 11th November. We are also looking forward to hearing Gwawr again in our concert in Carmarthen on 21st October. We have sung in St. Samlet’s before, and this concert was to help to raise funds for the church. Alterations to the interior have provided a separate area which gives the audience the opportunity to mingle and enjoy refreshments during the interval. With our MD D. Huw Rees and guest accompanist Huw Tregelles Williams we gave a performance of a variety of songs from our large repertoire. We also supported our Bass soloist Huw Roberts in O Gymru and Anfonaf Angel. Huw had his own solo spots, with well-loved traditional Welsh songs, accompanied by D. Huw Rees. A children’s choir always delights and swells audiences, and the choir from Lôn Las Welsh Primary had us captivated with their enthusiasm and commitment. Conducted by Mrs Enfys Rhys and accompanied by Glen Crooks, they sang a medley of songs from Oliver!, and three more in the second half, all in Welsh. We look forward to hearing them again in our Schools Choral Competition next spring. Our Choir’s Secretary Robert Harwood was compère for the evening.